Each suite is beautifully decorated with a private bedroom and spacious living room. All of our suites are fully equipped with two televisions, a refrigerator, microwave oven, coffee maker, two telephones with data ports and a well lit dining/work table and we have now added High-Speed Wireless Internet access throughout the entire hotel. Upgraded King Executive suites feature all the amenities of a standard suite, but include a larger parlor with and an upgraded bathroom with standing shower, garden tub and his & hers sinks. 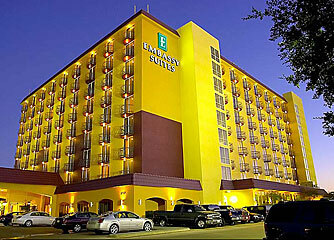 The Embassy Suites Dallas Market Center hotel is conveniently located in the heart of the Dallas Market Center area near the University of Texas Southwestern Medical Center (UTSW), Children's Medical Center and the American Airlines Center - home of the Dallas Mavericks and Dallas Stars. Downtown Dallas, Dallas Love Field Airport (DAL), the West End Marketplace, the Dallas Convention Center, the University Park area and the John F. Kennedy (JFK) Memorial are minutes away. Complimentary transportation is provided to and from Dallas Love Field Airport and within a three-mile radius.